Abstract: The MAPA: Digital Atlas of Ukraine program, undertaken by the Ukrainian Research Institute at Harvard University and its partners, brings the latest innovations of information technology to studies of modern Ukrainian history and contemporary political geography. 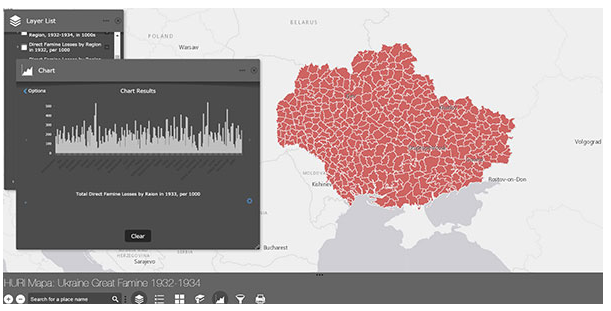 We conduct our own studies and encourage scholars and students within the Harvard community and beyond to use Geographic Information Systems (GIS) for illustrating and explaining economic, historical, political, and social transformations within Ukraine using spatial and temporal analysis. This presentation will touch on the varied historical and modern content of MAPA, and will then focus on the technical aspects of building MAPA, from digitizing historic data to hosting interactive web maps with ArcGIS Online, ArcGIS Server and AWS. Speaker Kostyantyn Bondarenko is an IT Professional at the Ukrainian Research Institute at Harvard University and Project Manager for the MAPA: Digital Atlas of Ukraine program. Since 2001, he has worked at the Institute to improve and expand its IT services by designing and developing websites, databases, and creating GIS maps and web applications. As the Project Manager for the MAPA: Digital Atlas of Ukraine program, Kostyantyn manages all technical and organizational aspects of the MAPA. He has worked on all modules of the MAPA program, presented MAPA projects at several conferences and is currently working on joint GIS projects between the Ukrainian Research Institute and its partners in the US and abroad.